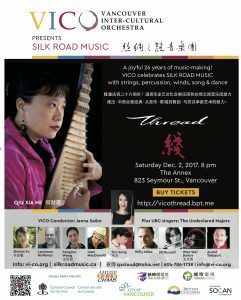 On December 2, 2017, two pioneering Vancouver ensembles – the Vancouver Inter-Cultural Orchestra (VICO) and Silk Road Music – weave their talents together to present THREAD, a joyful celebration of artistic innovation and musical friendships that span cultures, genres and decades. The concert is timed to mark Silk Road Music’s 26th year of creating and presenting Canadian music that fuses Asian sounds with Western/European and other world traditions. View promo video clips in English, French and Mandarin. **Update as of midnight on Dec. 1: we are SOLD out of advance tickets! There will be a few seats available at the door; we recommend arriving early to have a chance at them. THREAD promises to be an intercultural and multidisciplinary tour de force, featuring traditional and modern Chinese and intercultural repertoire, operatic song, and ecstatic contemporary dance, all in the intimate atmosphere of the Orpheum Annex. THREAD showcases a virtuosic who’s who of Vancouver-based performers, under the baton of conductor Janna Sailor: Qiu Xia He (pipa), André Thibault (guitar and oud), Yun Song (erhu), Zhimin Yu (ruan), Jill Russell (flute), Laurence Mollerup, (bass), Liam MacDonald (percussion), and members of the Vancouver Inter-Cultural Orchestra on violin, viola, cello, oboe, clarinet, French horn, and harp. Vocals will be provided by Feng Jun Wang and Willy Miles with Kevin Armstrong and Martina Govednik. Also featured will be renowned dancer Wen Wei Wang. The program includes new arrangements created especially for Thread by several remarkable Canadian composers: Alain Mayrand, Ron Hadley, Farshid Samandari, Jin Zhang, and Mark Armanini. View promo video clips in English, French and Mandarin. As recently as the mid-1990s, stereotypes of Chinese music as atonal and inaccessible dominated “mainstream” North Americans’ perceptions of this country’s sound. The idea of blending Chinese music with popular Western styles was seen as absurd, if not impossible. Silk Road Music changed all that. The ensemble pioneered the kind of Chinese-Western musical fusions that one now hears in acts ranging from The Sparrow Quartet to Yo Yo Ma’s Silk Road project. At the heart of Silk Road Music is the unstoppable artistic vision of its founder, Qiu Xia He, a one-time music teacher at China’s Xian Academy of Music and professional pipa player with the Shaanxi Music and Dance troupe. While performing with the ensemble at the Vancouver Folk Music Festival, she made the dramatic decision to stay in Canada, and was welcomed in by a household of Irish musicians on Hornby Island. It was there that the seeds of her extraordinary cross-cultural musical experimentations were planted. The concert will include compositions featuring a pipa solo concerto, two opera singers with chorus and orchestra, a Chinese trio with orchestra, contemporary dance, and a seven-piece chamber ensemble interpreting Brazilian, Spanish and Jazz music. – An Irish style suite opening with a ballad followed by a Jig and a Reel. – A contemporary work for three Chinese soloists: featuring Pipa, Erhu, Ruan. – A Pipa concerto bringing out the imagery and sounds of nature. – A Mongolian folk melody bridging the operatic styles of China and Europe. Gao Shan Qin – Traditional song, Arr. Farshid Samandari. – A Taiwanese folk melody cherishing the beauty of woman and man. – The Mississippi merges with the Yangtze for some Jazz exploration. – Latin Jazz Flamenco Rumba. OLE! – Northern Brazilian music in the style of Baiao. – Brazilian guitar composition re-arranged for Pipa, Guitar, and Tambourine . – A classical trio piece for Pipa, Erhu and Ruan. – Contemporary dance by Wen Wei Wang improvised around a Pipa classical solo. – Showcasing the beautiful and lyrical side of Chinese plucked and bowed strings. – A dreamy Chinese lullaby. Fly little Bird! – A famous Erhu solo based on Mongolian horse riding. – Silk and Bamboo music from the tea houses of south China.